After a lack of success in oil & gas exploration worldwide, Chevron and Shell bring new hope for US Gulf of Mexico oil production following two significant discoveries in the region. After a very disappointing 2017 in terms of oil and gas exploration worldwide, the US Gulf of Mexico is giving wildcatters reason to smile again as details were released in January of two significant discoveries by Chevron and Shell. New oil discoveries in the US Gulf of Mexico. Image source: Source: Rystad Energy UCube. The most recent well is the Ballymore discovery, where operator Chevron and 40% partner Total found 670 ft (204m) net pay of high quality light oil in the sandstones of the Jurassic Norphlet Formation. This formation is fundamentally different from all other plays in the Gulf of Mexico. It lies at the base of the sedimentary package just above the Louann Salt and therefore this pay is charged by the overlying source rock, with nothing from an underlying source, as the salt layer is impermeable. This also means the Norphlet Formation underwent the same pressure and temperature degeneration as its overlying source rocks. The reservoir quality at such depths could be questionable, as is also evident from the history of exploration in this play. Based on Rystad Energy analysis, we expect Ballymore to hold around 550 MMboe of resources, which could be developed as a tie-back to Shell’s nearby Appomattox deepwater development project. Shell is a pioneer in exploring this play. It took the company around 10 years before it found thick Aeolian Norphlet sandstone in the Appomattox discovery well, at around 2,000 feet (610m). Prior to that, all wells drilled in the Norphlet play were either dry or uneconomical. Chevron’s Ballymore discovery will add to the faith operators have in the Norphlet play, which extends into the eastern Gulf of Mexico and could be a potential target for future license awards. The other big wildcatting news unveiled recently was Shell’s Whale discovery, to the east of the Great White field and around 16 km from Shell’s Perdido platform. The Whale probe encountered more than 1,400 feet (427m) of net oil-bearing pay, and Rystad Energy estimates around 400 MMboe of resources in the find. This discovery lies in Alaminos Canyon and targeted the Wilcox Formation in the Perdido Fold Belt, which consists of north-east to south-west trending folded structures formed by gravity sliding. The Perdido Fold Belt extends farther south into Mexican waters, where Shell is now poised to make the most of its geological expertise in the play. 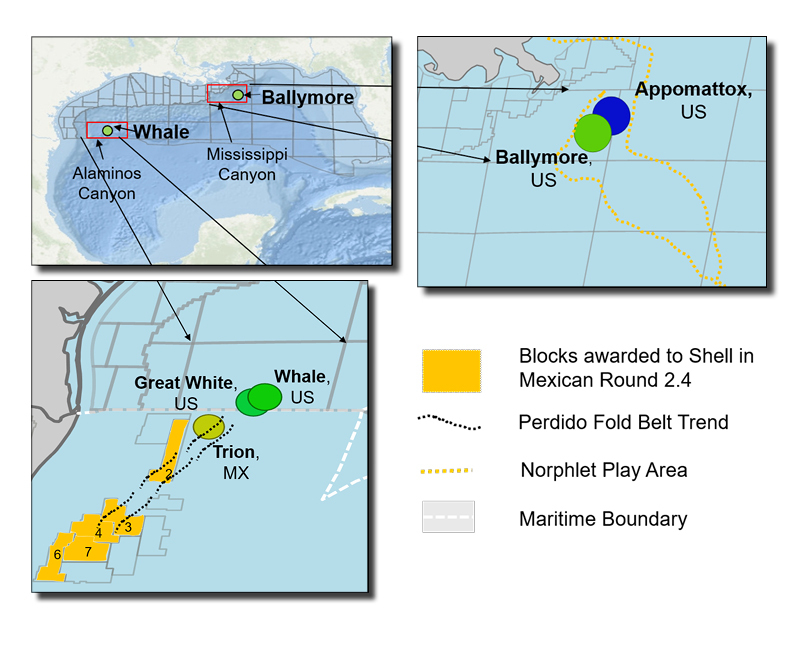 Shell nabbed five blocks awarded in Mexico’s recently-concluded Round 2.4, all of which appear to be directly aligned with the Perdido Fold Belt trend. This Regional Update is brought to you by Rystad Energy. The future of the Norwegian Barents Sea, following almost 30 years of exploration, is still in the making. A new look at the petroleum systems in combination with high quality seismic data may reveal the hidden secrets of this huge geological province that has already proven an exceptionally high technical success rate.